Catherine Lusurier (French, ca. 1752-1781), “Charlotte-Françoise DeBure”, 1776. Oil on canvas, 29 1/2 x 24 in. Milwaukee Art Museum, Bequest of Arthur & Noryne Riebs. (M1959.80) Photo by Larry Sanders. One thing to keep in mind when you look at art is not to trust the labels. Well, I don’t mean the labels that museums put on the wall next to the artwork–we try to make those as accurate as possible. I mean that you should not trust the little metal plaques that sometimes decorate the frames of many older artworks. Why? Let me tell you one an example. Tucked in one of the side niches in the Museum’s 18th-century French room, Gallery #8, is a painting of a young girl. Decked out in her lace finery, her blonde hair pulled back with a pink ribbon in that matches her pink dress and posed with a basket of flowers, she is the epitome of a blushing sweet child. The ornately carved frame has a metal label at center bottom that reads “H. DROUAIS, le fils”. You’d assume this must be the artist or the subject. 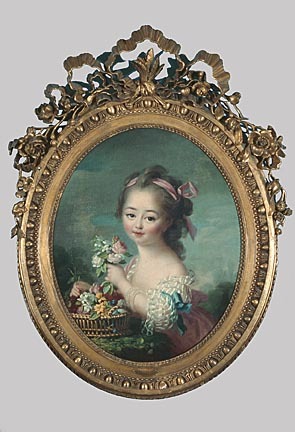 But upon looking at the Museum’s object label, you see that the painting is a likeness of young Charlotte-Françoise DeBure by the artist Catherine Lusurier, who lived from about 1753 to 1781. Neither of them is named Drouais. So, what’s going on with that frame plaque? When this lovely painting came into the Museum’s collection in 1959, staff cataloged the painting as by François-Hubert Drouais, the son of prominent French artist Hubert Drouais and a famous artist in his own right. And why not? The painting already had the metal label that reads (see below) “H. DROUAIS, le fils”. The H stands for for Hubert and le fils means “the son”. Add to that plaque a faint signature “F-H Drouais / 1776” (see below) at the right of the girl, and you have your answer that made for easy cataloging work. Not to mention that this painting had been published on the cover of Art News in 1942 as a painting by Hubert Drouais. Catherine Lusurier, “Charlotte-Françoise DeBure” (detail of frame), 1776. Milwaukee Art Museum, Bequest of Arthur & Noryne Riebs, M1959.80. Photo by Mel Buchanan. In 2000, however, we had to reconsider the attribution of this painting. The Museum was contacted by Madison, Wisconsin based scholar Helen Ashmore who was researching a little-known but talented painter named Catherine Lusurier. Ashmore believed that our “Drouais” painting was the same painting published in a May 1927 issue of the French journal Gazette des Beaux-Arts. The article by M.-E. Sainte Beuve was written in response to an exhibition of women painters of the 18th-century, and highlighted Catherine Lusurier as one of the best artists represented. Catherine Lusurier, “Charlotte-Françoise DeBure” (detail of signature), 1776. Milwaukee Art Museum, Bequest of Arthur & Noryne Riebs, M1959.80. Photo by Mel Buchanan. Some of the works by Lusurier were reproduced in the article, and one was a perfect match to the Milwaukee Art Museum painting of a young girl. The article identified the little girl as the daughter of Guillaume DeBure, a publisher and librarian to the French king. The article also illustrated a pendant painting by Lusurier portraying Charlotte’s mother, Mme DeBure. In 1927, the painting of young Charlotte-Françoise was still in the collection of the DeBure family. Today the location of the pendant painting of her mother, Mme. DeBure is still unknown. Armed with this information and after serious consideration, Ashmore and Milwaukee Art Museum curator Laurie Winters re-attributed the Museum’s painting to the artist Catherine Lusurier. 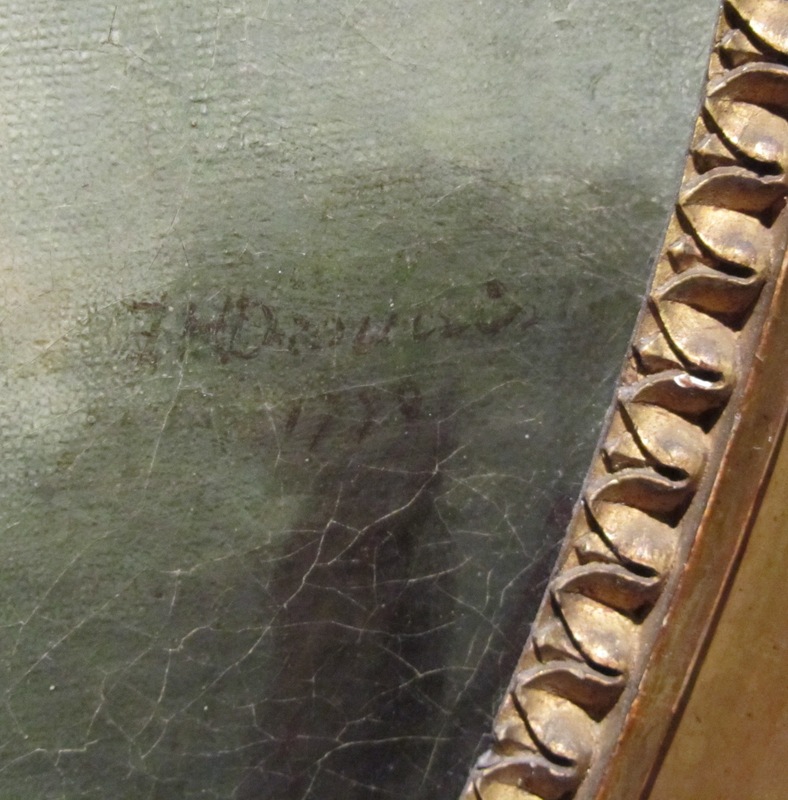 Another piece of evidence is that the “F-H Drouais / 1776” signature is of a form that François-Hubert Drouais did not use on any of his other paintings. That means that sometime between 1927 and 1934, when the painting entered the United States, it was assigned a new artist and applied a fresh “signature”. The reason for this will never be known, but it was most likely done in order to increase the painting’s value. After all, a portrait by a well-known artist (like Drouais) would be worth more than a portrait by a relatively unknown artist (Lusurier). The falsification was not questioned since they had similar 18th-century Rococo styles. In fact, the artists Catherine Lusurier and François-Hubert Drouais were cousins and certainly both studied with Hubert Drouais (although writers at the time felt that Catherine was the better artist). It is unfortunate that someone went to such lengths as to add the erroneous signature, because the original signature by Lusurier (mentioned by Sainte Beuve in her 1927 Gazette des Beaux-Arts article) is now lost. And it’s ironic that Sante Beuve’s article attempted to raise the standing of Catherine Lusuier just to have one of her best paintings almost immediately given to her male relative. But we are happy at the Milwaukee Art Museum to give Lusurier her due, and are proud owners of one of only 21 works by this gifted artist, who was highly regarded in her time and died very young, at age 28. So, the next time you see a little metal label on a frame of a painting, think twice before you take it for fact! This entry was posted in Art, Curatorial and tagged 18th Century Art, Catherine Lusurier, European art, French Art, From the Collection, Hubert Drouais, portraiture, women artists, Women in art. Bookmark the permalink. I’m just seeing your little piece here – almost six years after you wrote it – and am happy to see it. Nice work in promoting caution when viewing labels! I have several of Catherine Lusurier’s signatures in record boxes around here somewhere, most copied from the Paris archives and from the Louvre’s study center, just in case you or anyone has a yen to see them. Now you’ve got me wondering what the S-B article said in describing the signature on Mlle de Bure. Guess I’ll have to dig in the boxes for my own curiosisty.